THE YEAR IN WHICH President MacCracken founded the Vassar Summer Institute of Euthenics, 1926, was the same one in which he led a group of persons in the application for a temporary charter for a junior college in Bronxville, New York, to be called Sarah Lawrence College. The two events were closely connected, and both stemmed from MacCracken's desire to further "socialize" women's education and to educate more women to the issues of their changing times and needs. The story of how MacCracken got together with the aging millionaire William Van Duzer Lawrence of Bronxville, to give him advice and help him implement his plans for founding an experimental new educational enterprise, adds still another example to MacCracken's restless initiatives to change and improve the quality of educational opportunities for women after the war. At the time of MacCracken's inauguration in 1915, the Vassar alumnae announced that they would raise a million dollars as a present to the college in honor of its Fiftieth Anniversary. Their new president eagerly joined in the enterprise, never dreaming that among other things, the timely success of the campaign would nearly lead to his own downfall because of unsure fiscal policies within the board. The president of the Vassar Alumnae Association during the financial campaign was Louise Lawrence Meigs, Vassar 1891, William and Sarah Lawrence's daughter. MacCracken enjoyed working with Meigs while cultivating potential Vassar donors, and through her, he very soon got to know her father, "a gentleman of some means," as he later described him. In an interview which Constance Warren, Sarah Lawrence president between 1929 and 1945, conducted with MacCracken in 1961, he recalled that the first time he saw Lawrence, he "marked him down in his mind's eye, as a college president inevitably does," and it wasn't long after he made this mental note that he actually solicited Lawrence for funds for Vassar. No, I have made up my mind to do something. I do not know what. But whatever I do, I shall leave it in Bronxville, where I made the money. I believe in leaving the money where I made it, :and not putting it in to something else. That is only fair. MacCracken recalled that that was where the matter was left, on the surface of it, for the next few years, but that sometime in 1924 he wrote Lawrence a letter with an idea. In fact he apparently wrote not one letter but many, and the subject of the correspondence was MacCracken's suggestions about what Lawrence should do with his money. MacCracken must have felt an uncanny link to Vassar's past as he took up the subject of Lawrence's projected Bronxville gift to posterity. Certain aspects of the Lawrence-MacCracken situation seemed to be repeating history—the lead taken by an educator from out of town, Milo P. Jewett, in persuading Matthew Vassar to found a college for women, rather than spend his money in other ways, had enormous parallels to this Lawrence situation. MACCRACKEN'S OWN ROLE in keeping the memory of Matthew Vassar's creative genius alive in the twentieth century was a persistent activating force in his consciousness. He wrote and spoke about the founder, and his ideas and relationships, on many different occasions, and made himself extremely familiar with all of Vassar's recorded thoughts and dilemmas about the college's beginnings. He was very impressed with Vassar's ability to incorporate the best thinking of others, which had enabled him to actualize his plan although he started from a zero base of understanding about women's educational needs. MacCracken had especially studied the crucial role of Milo P. Jewett, the first president of Vassar (1861-64), in the formulation of Vassar's educational philosophy, and had come to the same conclusion as an earlier trustee, Benson Lossing, that without Jewett, "there would have been no Vassar College." He was closely interested in the king-maker aspect of Jewett's performance, and looked back at what had happened between Jewett and Vassar more than fifty years earlier as a kind of collective act of creativity, in which both persons had a chance to fulfill their desires. Jewett, a Baptist minister, had arrived in Poughkeepsie shortly before the Civil War from Alabama, where he had been the president of a women's seminary. A serendipity of timing enabled him in 1855 to take over Cottage Hill, a girls' school in Poughkeepsie founded by Vassar's feminist niece, Lydia Booth, who died in 1854. Matthew Vassar, who had come back to his home from a grand tour of Europe in 1846, had determined, while mulling over his affairs when abroad, that he wanted to found an institution which would be "of benefit to mankind." He also had in mind that the institution would necessarily involve a monumental building, which could serve as a memorial to the Vassar name for all time in Poughkeepsie. For the years between 1855 and 1861—after which plans for founding Vassar College were actualized through application for a charter—Jewett skillfully steered and advised Vassar, and helped him arrive at what finally seemed to him an inevitable conclusion that he must found not a hospital, not a secondary school, but a college, where women could get an education equal to that available for men. MacCracken, who had often rehearsed this nineteenth century relationship in his mind's eye, intuitively looked upon himself as Lawrence's Jewett. Just as Jewett had wanted something from his relationship with Vassar—the chance to be the creator of Vassar's college—so MacCracken saw an opportunity to do something important with Lawrence. He would persuade him of the benefits of starting a unique college in Bronxville, thus preserving his family name for posterity. That college would be Sarah Lawrence, a junior college for women who wanted the opportunity for experiential, self-directed education in a liberal arts setting. In guiding Lawrence towards the application for a charter, and in drafting it for him just as Jewett drafted parts of Vassar's application, MacCracken would have the chance to exploit his dream of an institution where the students came first, where the curriculum was built around the concept of their self-activation, and where they had the chance to translate experience of life into bona fide academic credit. This would make up for his rebuff over euthenics, and, who knows, perhaps even restore it to favor. In the years between 1915, when MacCracken first started to think in broad terms about innovation and experimentation in women's education, and 1924, when he wrote Lawrence a solicitous letter feeling him out about his plans, MacCracken's special interest in euthenics and "socialization" of education had grown, but the Vassar faculty's interest in euthenics had so dwindled as to be almost nonexistent. By 1924 it was clear that incorporating the philosophical bias of euthenics, as he and the Blodgett group conceived it, wholesale into the Vassar curriculum was not a real option for MacCracken. Too many on the Vassar faculty, especially in the sciences, were resistant to the whole idea. Frustrated and desirous of the opportunity to put his ideas into play, MacCracken quietly groped after the new opportunity afforded by Lawrence's desire to found an institution. Perhaps here was the chance to try his ideas in a special theatre. There were other considerations, also. Enrollment in women's liberal arts colleges had continuously increased since before the war, and the existent colleges did not have sufficient places to meet the demand. At that time I was also very much worried by the huge advance registration at Vassar College. ... In 1923, the year before 1 got into this with Mr. Lawrence's lawyer at his request, Vassar College had closed its registration for eight years ahead. And this means that the students who were to come to Vassar College were in their seventh grade in elementary school, and what could they know about college at all?
. . . It had to be stopped. The reform which helped stop "it" was, as we have already seen, the four-college admission plan by which the college was gradually put on a competitive basis. However, that conversion left many students out; there simply were not enough college places to go around. MacCracken noted to Constance Warren that in fact he had first felt the larger and pressing obligation to undertake responsibility for improving women's educational opportunities two years after he got to Vassar. He agreed at that time to work with a committee of the General Federation of Women's Clubs in New Jersey to assist in the organization of a woman's college, the New Jersey College for Women (which subsequently became known as Douglass College, part of Rutgers University). In fact, on February 12, 1918, the night a fire started in the dining hall at the back of Main Building at Vassar and quickly burned it down, MacCracken was summoned back to Poughkeepsie by phone from a dinner meeting in New Jersey where he was in the midst of formulating these plans. Sometime in 1924, I think it was, I wrote this letter. I wrote Mr. Lawrence in March of 1925 and we exchanged letters for some time in which I tried to discourage his idea, first of a boy's school. And I remember writing him a letter in which I told him there were almost too many boys' boarding schools now, that they were competing heavilY with each other, whereas women had no such opportunitY and most of their schools were crowded. And I proposed the idea of a junior college, which might be attached to the school. I believed at that time that it was a way of reaching him in his [then) present stage of thinking. He liked that idea, and then as the correspondence went on I tried to wean him of the idea of having a school at all and going in wholeheartedlY for the full two years of junior college. He was a complete novice in the knowledge of conditions in education at the time, and had to learn what a junior college was. . . . It was the first [junior college] to which the Regents gave a charter. Packer Institute [in Brooklyn, New York, presided over for a long time by Truman Backus, who from 1866 to 1883 taught English at Vassar] was in the nature of a junior college and had long existed, and there were other schools that gave courses to graduates, but if you think of a junior college as something actually legally chartered, this was, I believe, the first granted by the Regents. . .
Progressive education was in the air. I don't remember just when progressive education was organized, but it was shortly after this, I think. But I was in touch with Mrs. Queene Ferry Coonley of Chicago, who I think was the first president of the Progressive Education Association. She was one of the givers of Alumnae House to Vassar College; I believe that the organizational meeting of the Progressive Education Association of America was held at Vassar College, which I attended. I was very much interested. I also was a reader of John Dewey and his philosophy. I attended his lectures and invited him to lecture at Vassar College. . . his beliefs were shared up here. Miss Wylie of the faculty was a very progressive woman. ... She started an educational project. Miss Buck, her great friend, was one of the first to introduce participation by the students in the control of the classroom, and an experimental theatre. . . I had been, I think, at this time a member of a conference on progressive education that was held at Bradford Academy, near Haverhill, Massachusetts. Miss [Marion] Coats [Vassar, 1907, who was to become the first president of Sarah Lawrence] was the head then. She was considering the establishment of a junior college; what we were discussing up there was what a junior college should consist of. My recollection is that I presented a fairly complete idea of its organization and studies, its aims and the method by which those aims could be to some extent :obtained. And it interested Miss Coats and the others there. MacCracken carefully explained to Miss Coats, in a letter of November 30, 1925, exactly what he had in mind in using the term "socializing the curriculum: the concept that he felt might particularize the character of a new junior college plan, at Bradford and elsewhere. 1. Recognition that it is possible within the undergraduate years to carry out certain application of theory in science applied to life. 2. That theory and practice should go hand in hand during the learning process. 3. That the isolation of the sciences from each other and from other ways of looking at the same data as in philosophy, aesthetics and ethics, while immensely valuable from the point of view of the development of the sciences, has been lacking from the point of view of education; and that this data must be recovered for the use of the entire curriculum. History, philosophy and art must all make use of data now restricted to the area of science, otherwise they will die of dry rot. The sciences, on the other hand, have been in equal need of aesthetic contribution. 4. That through the isolation of the sciences, certain gaps in knowledge have been created which can never be filled by cooperation among them. This is particularly true of the applications of science to human life in the field of Euthenics, Education, Religion, Citizenship, and so on. As Constance Warren later pointed out, the conference which MacCracken participated in at Bradford led to the "reorganization, along progressive lines," of Bradford Junior College, and eventually to the recommendation that Coats be made the first president of Sarah Lawrence College, while MacCracken would become the chairman of the Sarah Lawrence board of trustees. Mr. Lawrence was always a creator. He loved to personally plan and build important structures such as the Hotel Gramatan, the Lawrence Hospital, the Osceola Inn in Daytona Beach, and others. It was in this spirit that his home, Westlands, was built in 1914-16. ... At eighty-two he was confronted with the problem of a future for Westlands. He was determined that the property should serve some useful purpose and not become just another oversized house to be demolished or sold for taxes. One suggestion was made that the Lawrence Hospital [a Bronxville hospital] should be removed to the Westlands site. This received serious consideration but was subsequently abandoned as not being a suitable location. William Lawrence then turned his attention, according to his son, to the possibility of founding a women's college. His wife had always been "an enthusiastic advocate of higher education for women," and the Lawrences' daughter had gone to Vassar. I remember Dr. James Taylor, then president of Vassar, visiting at our home and much later, I believe, President and Mrs. MacCracken were guests down in Florida. There can be no doubt that Dr. MacCracken's influence, advice, and later, his devoted service to the infant college were of the most paramount importance in its establishment. The original idea was that Sarah Lawrence should be a two-year junior college on the theory that many girls could accomplish more there than in four-year colleges, which they frequently left in the middle of their course. This, I believe, was Dr. MacCracken's first suggestion. According to the memo of the younger Lawrence, the rest of the Lawrence family did not go along with the college plan at first. They felt that "it was too late [at age eighty-two] for the elderly man to personally undertake the erection" of a college. But William Lawrence was stubborn, and had a "one-track mind." So before he died, he obtained a provisional charter from New York State with the help of MacCracken, made plans for the layout of the college campus and buildings, and even personally staked them out.
. . . As I have heard the story, when word leaked out in the newspapers that Mr. Lawrence intended to give his place, with money, for an educational institution, Nicholas Murray Butler boarded a train and came right up here to try to get it for Columbia. Mr. Lawrence was furious, and these two bull-headed old gentlemen met head-on. Mr. Lawrence was so mad that he immediately got in touch with MacCracken, Mr. Lawrence's daughter having attended Vassar, and asked MacCracken to consult with him as to what he could do with his money.
. . . Oh, I know all about that. .. . Mr. Butler threatened Mr. Lawrence about 1926. He said, in substance, "You can't start a college in the New York area unless it is with my consent, and I don't consent. And I can put an end to Sarah Lawrence College." It was already announced then, and that was the first that Mr. Butler had heard of it. He invited Mr. Lawrence to give the college to Columbia as a junior college of Columbia; and he told him he would give the new college the same relationship to Columbia that Barnard College enjoyed. ... And this disturbed Mr. Lawrence so much that it led to his request for an affiliation with Vassar College for his own protection. At the end of such five year period, or when a permanent charter has been secured, and if the agreement has proved satisfactory to both parties, a transfer of Sarah Lawrence Junior College with all of its property of every kind may be made over to the Vassar Corporation, and the Sarah Lawrence Corporation retire from business, with the proviso, however, that the Vassar Corporation shall forever keep the name and for ten years thereafter retain the present site-that is, the Westlands property, the founder's home and the junior college plan. If the arrangement has not proven satisfactory to both parties, the Board of Trustees of Sarah Lawrence College shall have entire discretion to determine the future of that institution. MacCracken went on to tell Warren that not only Nicholas Murray Butler, but also Dean Virginia Gildersleeve of Barnard, tried to twist Lawrence's arm, and that Lawrence was "simply terrified" to which Warren replied, "Perhaps not so terrified as made. . . furious. . . because. . . he was a man of very strong independent principles. ..." MacCracken countered: "Yes, but he was an old man then; he was ailing. He was letting go of his money. As he says in one of the letters here to me [which MacCracken had brought to the interview], 'I feel like the captain that has launched a ship without either sails, mast, or rudder. Now you must provide these for me.'" "I wish someone would tell me what to do with my money. It's the plague of my life-keeps me awake at nights-stocks going down, banks breaking, insurance companies failing," Vassar observed to Jewett, when his nephews, Matthew Vassar Jr. and John Guy Vassar Jr. were clamoring for him to put money into a local hospital which they wanted to endow. Sarah Bates Lawrence died on May 8, 1926, after which her husband wrote to Marion Coats on May 26, inviting her to head the college. In a June 4 letter to his son, he first mentioned adding "Sarah" to the name of the Lawrence College. Coats replied that she was considering accepting the invitation to assume the leadership of the school, but that she was duty-bound to put in two more years at Bradford Academy. She proposed, however, that they proceed with plans for the college and aim for an October 1927 opening. Prior to the opening, she suggested, she would be on a retainer for her consulting services. Subsequent letters exchanged between Coats and MacCracken indicated that she relied heavily on MacCracken for advice. During their correspondence, she proposed that Sarah Lawrence Junior College serve as an overflow college for Vassar freshmen and sophomores, making more intrinsic a previously conceived looser affiliation between the two, in which only the trustees and administration of the college were involved. On July 20. 1926. Marion Coats formally accepted the invitation to become the head of Sarah Lawrence College when it opened in 1928. Lawrence wrote her on August 20. 1926, that he "looked to her" to "steer this ship which is yet in the harbor, after it is out to sea: In September. she submitted "My Profession of Faith. Educationally, and a Letter of Introduction to the Board of Trustees of the Sarah Lawrence Junior College." Meanwhile MacCracken had been assiduously pursuing the elusive charter. In April 1926 he submitted a statement to the New York State Board of Regents in defense of the junior college concept. The charter of the college would not be approved, however, until December 9. 1926, when the acceptance of such a charter by the state inevitably caused much publicity, some of it unwelcome. Later that month MacCracken wrote of his concern about the direction the press was taking. "A million dollar college for brides" became its easy handle for reporters. This was not exactly what MacCracken had in mind when he thought of a curriculum which applied itself to the subject matter of euthenics and an integration of the sciences with the arts. And the costly $1500 tuition at the time was a predictable hurdle and target. Nevertheless. in the face of these challenges. MacCracken made a statement to the Vassar board that Sarah Lawrence should be a project of cooperation between the two institutions. He proposed a formal five-year affiliation. Two days before he died [on May 16, 1927], [Mr Lawrence] summoned his secretary to his bedside and dictated further thoughts and instructions about how to proceed with the College construction. MacCracken and the Vassar trustees on the Sarah Lawrence board carried the plan to completion and the college opened in September 1928, but not without some financial problems. Half way into the very hectic period of construction, the college needed $250,000 to complete its buildings. It was clear that the Lawrence family was not interested in invading the family trust to further support the college. Dudley Lawrence, who had agreed to serve as a college trustee, vividly recalled an anxious afternoon in which MacCracken and Ray Morris (brother of Helen Morris Hadley), a Vassar trustee on the Sarah Lawrence board and a partner in Brown Brothers, "ventured into the depths of Wall Street to get money" from the Bankers Trust Company. Everyone left the interview pessimistically believing no money at all would be forthcoming, but "Dr. MacCracken's prestige and Mr. Morris' high reputation in Wall Street... brought about (an) astonishing result." The operation was financed. In June, invitations went to certain Vassar trustees to serve on the board of Sarah Lawrence College. Among those tapped, in addition to Ray Morris, were Stephen Duggan, Arthur Lesher, and J. Lionberger Davis. (Later, under Warren, another similar group of trustees from Vassar succeeded them.) 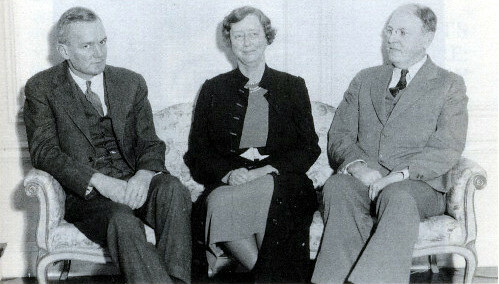 Marion Coats, still finishing out her term at Bradford, prepared at long distance during this period to assume the presidency at the institution's opening, by then scheduled for the fall of 1928. A first sign of incipient disagreement between MacCracken and Coats, however, came in February of 1928 when Coats addressed a group at Vassar's four-year-old-Alumnae House. Her speech caused MacCracken to write her a letter, criticizing her remarks that denigrated other four-year colleges in contrast to Vassar. He wrote that other Vassar members shared his opinion. The dispute seems to have had its roots in an apparent misconception held by Coats that dated at least as far back as June 1926, when she lobbied for a strong "affiliation" between Vassar and Sarah Lawrence. She and her mentor clearly had differing ideas about what that meant. In April of 1929, Vassar's admission of a student from Sarah Lawrence to its junior class appeared to set a precedent, but the Vassar faculty that year expressed opposition to Sarah Lawrence students having blanket permission to transfer to Vassar with advanced standing. Marion Coats issued what registered as an ultimatum regarding Vassar's mandatory acceptance of Sarah Lawrence students, and she went too far for MacCracken. He wrote that, considering her ultimatum, he could not continue both as president of Vassar College and chairman of the board of Sarah Lawrence, and he would therefore withdraw from his Sarah Lawrence commitment. Two days later, on May 8, she countered with an offer to resign herself, and suggested Constance Warren as her successor. It was not until July 17, 1929, that a press release announced the resignation of Marion Coats as president, effective at once. With the resignation of Marion Coats and the arrival of Constance Warren, Sarah Lawrence, MacCracken, and Vassar entered a new era of friendship. From that point until he retired in 1936, as planned, from the Sarah Lawrence board after ten years of service, MacCracken served the role of trustee advisor to Warren's eminently successful presidency. In March of 1931 Warren led the board in the college's application for a permanent charter. Although there was some debate as to whether they should file formally or continue under the provisional charter that had been granted in 1926, the permanent charter was pursued, and on September 10, 1931, a permanent "absolute" charter was granted, empowering Sarah Lawrence to confer a bachelor of arts degree. The announcement of the founding of a college devoted primarily to experiment, with its own curriculum, its own professors, and its own students was, of course, greeted with derision twenty years ago. Today all over the land carefully planned experiments at the college level, and even at the university level, are going on. In Sarah Lawrence's case, MacCracken observed, the experimental college created a new trivium through the juxtaposition of science, social science, and art. The physical laboratory stands in the modern college side by side in the same building with the studio of painting, to the mutual profit of both. No longer is science tucked away at the back of the college campus in utilitarian buildings while art occupies the foreground adorned in pseudo-Gothic. Art and science, in short, are but two words describing the same process, the search for knowledge and its expression by man's unconquerable mind. It was inevitable also that Sarah Lawrence should begin to experiment with the earlier years of college as the place for improvement. The unfortunate gap between school and college, both in matters of discipline and in organization of knowledge, had resulted in an immense mortality [the loss of students unprepared to bridge the gap]. Because of "inadequate teaching in the colleges," young women were not making progress towards planning their life goals. At Sarah Lawrence, under Constance Warren, "a group of young teachers fully trained in the social sciences" applied their theories "not to students in general but to their own students in particular." The result was, MacCracken concluded, that Sarah Lawrence exerted its very powerful force for change on national education by orienting its students to use their creative imaginations in entering life actively through their education; by enjoying its experiences; by solving presented problems; and, at the conclusion of their education. by engaging life in the larger world, as they had their education. The Sarah Lawrence attitude of preparing students to enter life as an interdisciplinary laboratory had been a real contribution to American education. This implantation of strong purpose early in the college course is the secret of what may be called educational public health. "Strong purpose" stood for the quintessence of modernism in education to MacCracken. He knew, however, that in the Vassar of his time some of the faculty had been similarly shaking their students up as hard as they could to accomplish the same worthy objectives and had succeeded. There was more than one road to reform. Yet he undoubtedly displaced his frustration over the plight of euthenics at Vassar through his accomplishments in Bronxville. It was Harold Taylor, president of the BronxviIle college from 1945 to 1959, who in a public statement at the time of MacCracken's retirement from Vassar, perhaps most accurately stated it. Sarah Lawrence, Taylor said, was the product of Dr. MacCracken's suppressed desires: "It was his dream child born out of wedlock."